Rainwater is a FREE and valuable resource. We can easily take advantage of this resource with Rain Harvesting. Rain Harvesting is the catchment and storing of rain water for later use. How much water do you need to store? That answer can vary depending on whether you are holding water for irrigation, livestock, or an emergency water supply for your family. Everyone that has worked with liquid storage and transfer knows a quality tank and good plumbing components are essential to providing desirable results. We are Tanks Alot. We are an environmentally conscientious company. 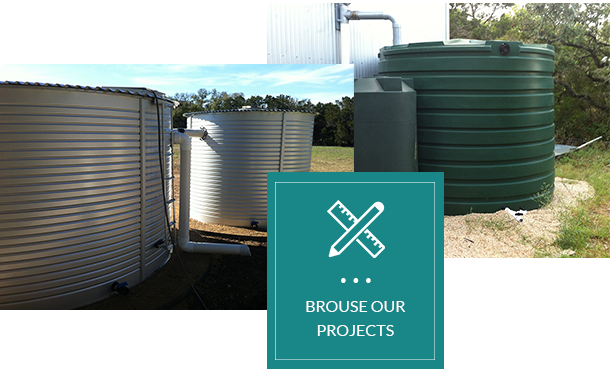 WE ARE A ONE STOP SHOP FOR ALL OF YOUR RAIN WATER COLLECTION AND STORAGE NEEDS. Our company is a family owned and operated business. Jesse Beavers, owner, a native-born Texan, veteran of the US Army, and is an ARCSA Accredited Professional having knowledge of rainwater catchment systems, design and construction..
We are an environmentally conscientious company who handles polyethylene tanks for rainwater harvesting, water storage and chemical storage. We also sell liquid storage tanks that can be used for many purposes in the oilfield industry. Tanks Alot is amazing to work with! They designed and installed our rain water collection system. Wouldn’t change a thing about our experience working with them!